First off, no, I am not dead. You probably think that, dear Blog, but I am alive and kicking. Yes, I still love you. Yes, I still love to write. What happened? You know, I am not sure. Mon dieu bon dieu, I had to log into the WordPress website and that meant I had to go find my phone and find my password. Yes, really. I got logged out of my own website due to inaction. Now, I have to re-figure out how to add a dang photo. Old dogs, new tricks?? There used to just be a button to add media. Really? I am still the Sabbatical Chef. I have business cards to prove it. I still own the domain. Don’t I? So, I just found the button that would let me upload a photo, only it won’t let me upload the photo that I took yesterday, the photo is mine- well, a high school kid took it, but she took it with MY phone. So, therefore, it is MY photo. And I want to upload it onto MY blog on MY website. I will calmly try again. I am getting ever so aggravated. I found the media button, but it will not let me upload the photo that I saved on my desktop. Damn. What happened to you, Blog? Playing hard to get?? Next try. I am slowly beginning to lose it. Lose what? My mind? My patience? My religion? So, finally a photo. Now, how in the H.E. Heck do I keep writing the blog? I just want to write. Okay, so I seem to be back in the land of the Sabbatical Chef writing a new blogpost. Sheesh. Anyway. The above photo is me and my NEW cousin, Amy. Oh, by the way, Amy, do you know that I am a wannabe writer? I don’t think I told you that little fact. Maybe because I forgot about it while taking a three month break from writing anything other than lesson plans and progress reports. Yep. This is my alter ego kinda sorta. Teacher by day, blogger by night. Not really. So, here is what I have been up to. Finding a new cousin. Seriously. Merci, Ancestry. We are first cousins. We compared as much as we could yesterday when we met for the first time. I AM SO HAPPY! I look forward to spending time with New Cousine and getting to know her. My aunt, Daddy Tommy’s sister, gave her up for adoption at birth. We have been apart for 60 years. Blood and DNA don’t lie. Welcome to the family! It was a wonderful trip. I spent a lot of quality time with Vincent Van Gogh, Napoléon, and Claude Monet. I ate foie gras only once and the best crêpes ever. I even got talked into going to Disneyland Paris. Ratatouille and Rémy were waiting for me. 3. I have been spending as much time as possible with the Most Amazing Granddaughter Ever. She calls me “Ma.” I am totally in love with this little pumpkin who is now 2+ years old. Is there anything more wonderful than Gramma-hood? Non. 4. I have been reading some great books. My current page-turner (I actually swipe- I have a Kindle) is Ruth Reichl’s Garlic and Sapphires. So, today I opened up the paper (yes, we still read an actual print newspaper, the Durham Herald-Sun) and guess who is talking about her newest book just a few miles away from me? Yep. Ruth. Right this minute. I should have been able to at least catch a glimpse of her in real life. But, no, it was not to be. She is promoting her latest book, Save Me The Plums: My Gourmet Memoir. I will buy it next. Thank you, Ruth. In Garlic and Sapphires, I am reading about the beginning of her career at the New York Times. She makes every bite she puts into her mouth sound like the sexiest, most delicious mouthful of food ever. What a writer. Okay, I think that I am sorta kinda back in the blogging saddle. I added some photos, found the “add a block” symbol. Of course, I will probably forget it all by the next time I decide to write. I won’t wait so long. C’est promis. 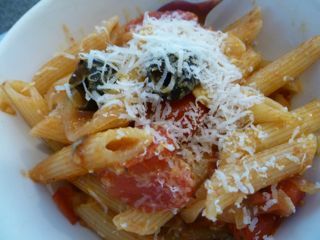 Ms. Sunée calls it Midnight Pasta #3: Penne with Popped Tomatoes, Anchovies, and Onions. It is simple to make and so good. Très provençale, aussi! Tant mieux. Heat olive oil in a large skillet on medium high to high heat. Add tomatoes and cook, tossing often, about 10 minutes. Cover and let cook about 3 minutes. Uncover, season with salt and pepper and a pinch of sugar. Add onion, toss, and cook for 3-5 minutes. Add garlic, red pepper flakes, anchovies, and olives. Lower heat. Cook penne in salted boiling water just until al dente. Drain, reserving about 1/4 c. pasta water. Add pasta to skillet and toss. Heat about 1 minute, adding some of reserved pasta water if too dry. Toss to combine. Divide pasta into 2 warmed bowls. Serve immediately. Add another crack of pepper and garnish with cheese, if desired. Bon appétit, mes amis. Thank you, dear readers. It’s spring, the earth is coming back to life, flowers are blooming every where you look. There is so much to be grateful for- new family members, books, good food, art, a big wide world out there to explore. And grandbabies for those of us who are femmes d’un certain âge! I wouldn’t trade what I have for anything.